In the past 25 years, the prevalence of obesity has increased worldwide, and has consequently lead to the widespread popularity of bariatric procedures. Laparoscopic sleeve gastrectomy (LSG) has been shown to be an effective surgical procedure for managing morbid obesity. However, there is an increase in the incidence of postoperative complications, which includes leaking, bleeding, stenosis and fistula formation. Gastric fistula can occur post-LSG if a leak is not treated early or in the case of unsuccessful treatment. However, although gastrobronchial fistulas are rare, complications can be life-threatening and challenging both diagnostically and therapeutically. 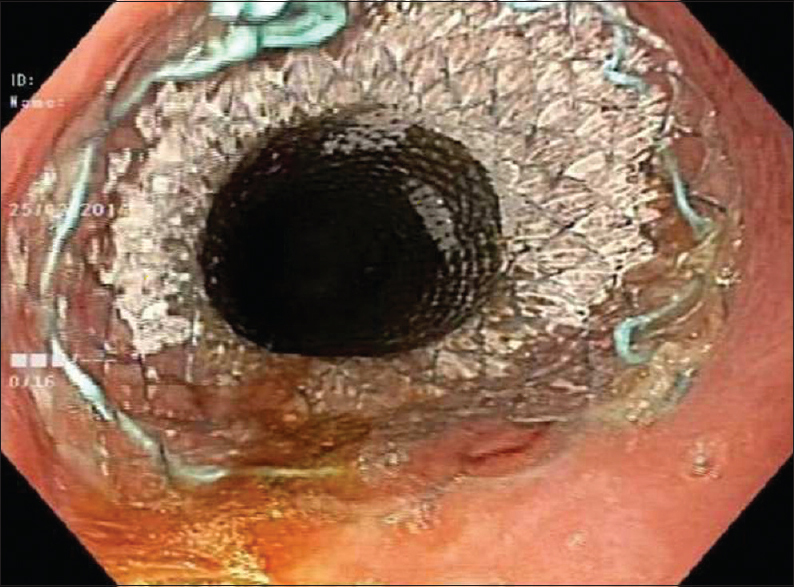 Endoscopic intervention is a valuable option for patients who develop small-sized fistulas or who cannot be treated surgically because of their unstable clinical conditions. The Niti-S esophageal stent is made of a braided nitinol wire (nickel–titanium alloy), and a polyurethane membrane fully covers the entire stent. The proximal and distal ends also flare in a “dog-bone end design,” which decreases the risk of migration. Here, the author presents a case of a middle-aged patient who developed gastric fistula post-LSG and was managed with gastrobronchial fistula closure using an OTSC and a Niti-S esophageal stent. A 46-year-old male patient presented to the Emergency Department of our tertiary care center in Riyadh, Saudi Arabia, with a 3-month history of productive cough. The patient had undergone LSG at another hospital 1 year ago. Two weeks postsurgery, he presented to their emergency department with chest pain and shortness of breath. The evaluation had revealed left hydropneumothorax, complicated pleural effusion, empyema and a perigastric collection with free air, suggestive of a leak. The patient underwent chest tube drainage and was managed by total parental nutrition and placement of an esophageal stent. Although he appeared to be doing well on initial management, his respiratory symptoms returned every few weeks. Therefore, the patient required multiple admissions for treating lower respiratory tract infections and underwent repeated endoscopic procedures to control the leak by esophageal stenting. The last attempt included placement of a short, partially covered, gastroesophageal metal stent, which was kept for 3 months. Three weeks after removing the last stent, the patient presented to our hospital with the same respiratory symptoms of chronic cough and shortness of breath. He had stable vitals, and his systemic examination was normal, except for some signs of consolidation (pneumonia) on chest examination. His hemoglobin level was 12.2 g/dL, and the platelet count was normal. C-reactive protein was 36.2 mg/L. Renal and liver function tests were normal. 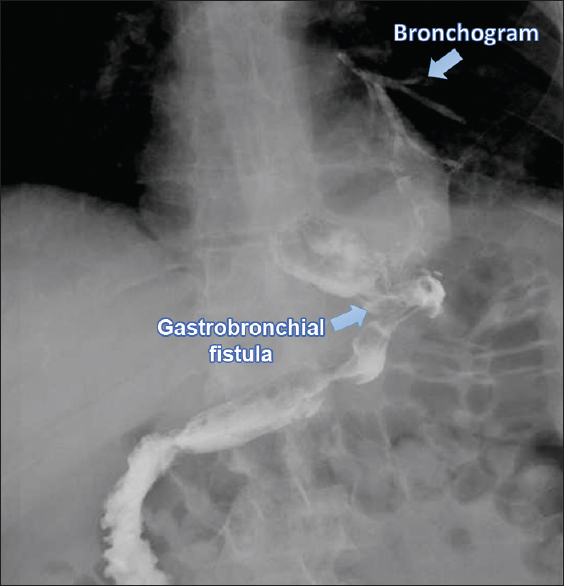 On upper gastrointestinal series, the patient was found to have a fistula communicating the stomach to the bronchial tree of his left lung (gastrobronchial fistula). After the initial resuscitation, the author decided to close the fistula by endoscopic means [Figure 1] and [Figure 2]. 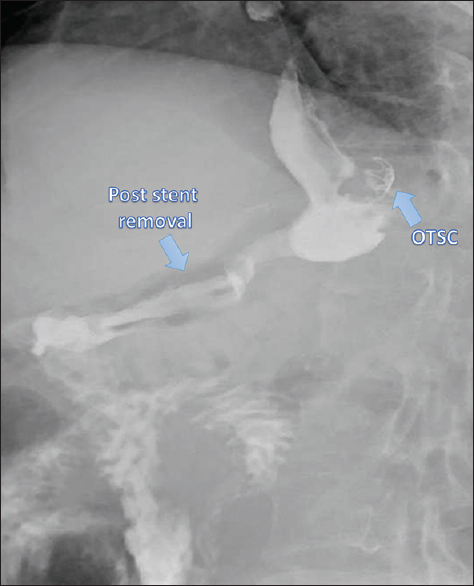 The procedure was done under general anesthesia, and it was initiated using an OTSC cap to aspirate the fistula opening [Figure 3]. Simultaneously, an extra-long, fully covered, metallic stent (Niti-S) was inserted [Figure 4] and [Figure 5]. No postprocedure complications were noted, and the patient showed marked improvement in his respiratory symptoms. He was discharged 7 days after the procedure. As the patient continued to demonstrate symptomatic improvement upon his follow-up visits, the stent was removed 12 weeks after discharge [Figure 6]. A repeat gastrografin meal examination showed a fully healed leak and complete fistula closure. After removing the stent, the patient was followed up for 12 months, and no recurrence was noted on any of the repeated gastrografin studies. Obesity has become a major health problem; consequently, bariatric surgery is increasingly being performed, with the most common being laparoscopic Roux-en-Y gastric bypass and LSG. Such trends also increase the likeliness of postoperative leaks. However, gastric fistulas following bariatric surgery are only seen in 0.9%–2.6% of cases, but its chances increase to 8% when a second operation is carried out. Among all complications of LSG, gastrobronchial fistula development is one of the most rare complications. As the majority of post-LSG leaks occur in the proximal part of the stomach, the most common anatomical location of gastrobronchial fistulas is at the level of the angle of His. Gastric fistulas and leaks have been suggested to occur because of ischemic changes in the gastric wall and not because of staple line disruption. During stenosis of the gastric pouch, the intraluminal pressure increases and directs food toward the fistula, leading to recurrent subphrenic infections., A gastrobronchial fistula can result from a subphrenic abscess. This infection can spread either through direct erosion of the diaphragm or by lymphatic flow to the chest. Subsequently, a lung abscess is formed and eventually drains into a bronchus. In the case reported here, there was a leak in the proximal part of the stomach, which leads to the formation of a gastrobronchial fistula. 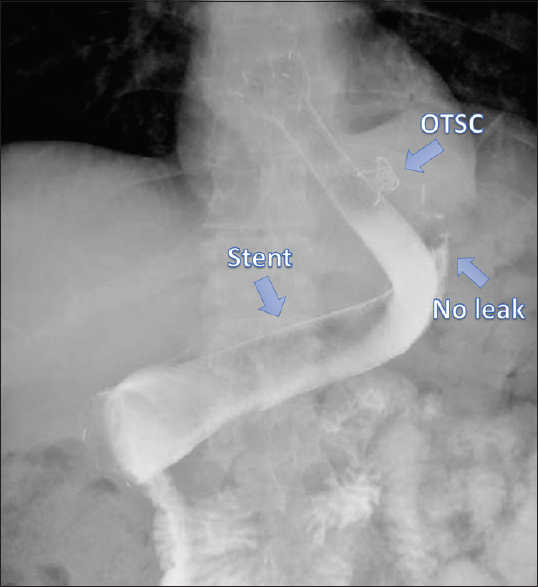 In the case reported here, treatment of the leak by a partially covered stent was unsuccessful because when the stent is short and has a small diameter, it might be ineffective in completely sealing the defect. For the stent to be positionally stable, there should be a sufficient amount of friction between the stent and the mucosal surface, which is not the case when the stent is short and narrow. The high risk of migration and incomplete sealing of the defect makes controlling the leak difficult, and thus leads to the formation of a gastrobronchial fistula. To achieve complete fistula closure, a different approach was used at our hospital. The fistula was managed by a combined endoscopic intervention using OTSC and a novel, extra-long, fully covered stent. This stent was used to fit the gastric sleeve diameter, and thus ensure enough mucosal contact for a more stable positioning and lower risk of migration. Furthermore, the bigger the stent size, the more is its ability to reduce the intragastric pressure, thereby making it more effective in controlling the leak and facilitating faster healing of the fistula. Using the OTSC may provide additional help by working as an anchor for the stent, and thus lowering the risk of migration. The method of using endoscopic stents and OTSC can offer a minimally invasive alternative to surgery, as it was demonstrated in our reported case. The main complication of stent placement is migration, but the author did not observe any migration or other complications during the period before the stent was removed. After 12 weeks, the stent was taken out, but OTSC was kept in place. The patient's condition, including his respiratory symptoms and pneumonia, improved dramatically after the removal and on follow-up visits to our clinic, no recurrence was observed. This is one of few reports on successful closure of gastrobronchial fistula using the combination of OTSC and a fully covered metal stent. Therefore, this case highlights the use of a novel, combined endoscopic technique and approach as a safe and effective modality that is justified when attempting gastrobronchial fistula closure post-LSG. The author certifies that he has obtained all appropriate patient consent forms. In the form, the patient has given his consent for his images and other clinical information to be reported in the Journal. The patient understands that his name and initials will not be published and due efforts will be made to conceal his identity, but anonymity cannot be guaranteed. Angrisani L, Santonicola A, Iovino P, Formisano G, Buchwald H, Scopinaro N, et al. Bariatric surgery worldwide 2013. Obes Surg 2015;25:1822-32. Armstrong J, O'Malley SP. Outcomes of sleeve gastrectomy for morbid obesity: A safe and effective procedure? Int J Surg 2010;8:69-71. Walsh C, Karmali S. Endoscopic management of bariatric complications: A review and update. World J Gastrointest Endosc 2015;7:518-23. Campos JM, Siqueira LT, Meira MR, Ferraz AA, Ferraz EM, Guimarães MJ, et al. Gastrobronchial fistula as a rare complication of gastroplasty for obesity: A report of two cases. J Bras Pneumol 2007;33:475-9. ASGE Technology Committee, Banerjee S, Barth BA, Bhat YM, Desilets DJ, Gottlieb KT, et al. Endoscopic closure devices. Gastrointest Endosc 2012;76:244-51.
von Renteln D, Schmidt A, Vassiliou MC, Rudolph HU, Caca K. Endoscopic full-thickness resection and defect closure in the colon. Gastrointest Endosc 2010;71:1267-73. Shehab HM, Hakky SM, Gawdat KA. An endoscopic strategy combining mega stents and over-the-scope clips for the management of post-bariatric surgery leaks and fistulas (with video). Obes Surg 2016;26:941-8. Abraham A, Virdi RP, Rajan D, Singh J, Mustacchia P, Iqbal J, et al. Gastrobronchial fistula following laparoscopic sleeve gastrectomy. BMJ Case Rep 2012;2012:bcr2012006789. Jha PK, Deiraniya AK, Keeling-Roberts CS, Das SR. Gastrobronchial fistula a recent series. Interact Cardiovasc Thorac Surg 2003;2:6-8. Quezada N, Maiz C, Daroch D, Funke R, Sharp A, Boza C, et al. Effect of early use of covered self-expandable endoscopic stent on the treatment of postoperative stapler line leaks. Obes Surg 2015;25:1816-21. Fernandez AZ, Luthra AK, Evans JA. Endoscopic closure of persistent gastric leak and fistula following laparoscopic sleeve gastrectomy. Int J Surg Case Rep 2015;6C:186-7. Ramos AC, Ramos MG, Campos JM, Galvão Neto Mdos P, Bastos EL. Laparoscopic total gastrectomy as an alternative treatment to postsleeve chronic fistula. Surg Obes Relat Dis 2015;11:552-6. Nedelcu AM, Skalli M, Deneve E, Fabre JM, Nocca D. Surgical management of chronic fistula after sleeve gastrectomy. Surg Obes Relat Dis 2013;9:879-84. Liu SY, Wong SK, Ng EK. Novel oesophago-gastro-duodenal stenting for gastric leaks after laparoscopic sleeve gastrectomy. Obes Res Clin Pract 2015;9:214-9. Galloro G, Magno L, Musella M, Manta R, Zullo A, Forestieri P, et al. A novel dedicated endoscopic stent for staple-line leaks after laparoscopic sleeve gastrectomy: A case series. Surg Obes Relat Dis 2014;10:607-11. Simon F, Siciliano I, Gillet A, Castel B, Coffin B, Msika S, et al. Gastric leak after laparoscopic sleeve gastrectomy: Early covered self-expandable stent reduces healing time. Obes Surg 2013;23:687-92. Eubanks S, Edwards CA, Fearing NM, Ramaswamy A, de la Torre RA, Thaler KJ, et al. Use of endoscopic stents to treat anastomotic complications after bariatric surgery. J Am Coll Surg 2008;206:935-8.